Ok, so this is my favourite food of all times! 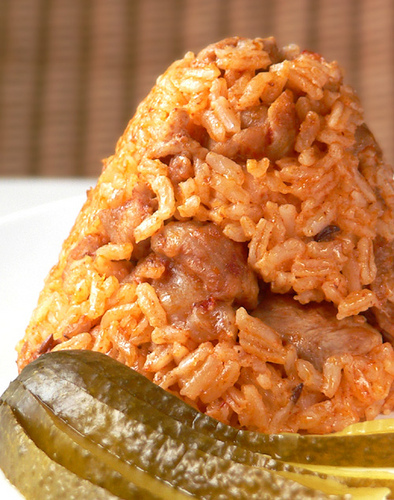 My grandma's famous Serbian Rice Meat. We call it Serbisch-Reisfleisch in German which I think sounds nicer, nut the thing is, I've never met anyone who has tried it and not liked it! And it's fairly easy to make too, so I wonder why I never tried myself before. Maybe I was intimidated. My gran used to give cooking classes and I've never come across a meal she didn't master. And trying any of er recipes and getting the food to her standard has never really worked for me. It took me ages just to get her pancakes right! Anyway, I recently had to cook for my team at work (our department takes turns - every month, one of the teams has to cook lunch for everyone) and I needed something easy to make, cheap, crowd-pleasing and something I could make in large quantities and rehet easily. Cue Serbian Rice Meat! Heat some oil in a pan. Sear the mince in the pan until brown. Either transfer to a deep pan or, if your pan is big enough and you have a lid for it, continue with the same pan. Add the rice and roast it for a minute or two with the mince. Add the water, beef stock and tomato puree. Stir well until the tomato puree is distributed evenly. Add some salt and black pepper and bring rice to a boil. Once the mix is boiling and you can see bubbles, turn the heat off completely and cover the pan with a lid. Leave it for 20 minutes and do not lift the lid! After the rice has been standing for 20 minutes, stir well and add coarse black pepper and cayenne pepper to taste. Serve hot! Now, my family loves this really spicy and you can add some paprika if you feel like it! Instead of just beef mince, you can also go half-half with beef and pork mince but that's up to taste. This dish is also easily turned into a vegetarian version by using Quorn mince and vegetable stock and it tastes just as yummy! Serbian Rice Meat is easily freezable and you can leave it over night in the fridge and make it for lunch / dinner the next day. If you plan on leaving it stand overnight, go lightly on the seasoning as the rice will absorb it and make it really spicy, really fast! Serve piping hot and add cayenne just before serving! 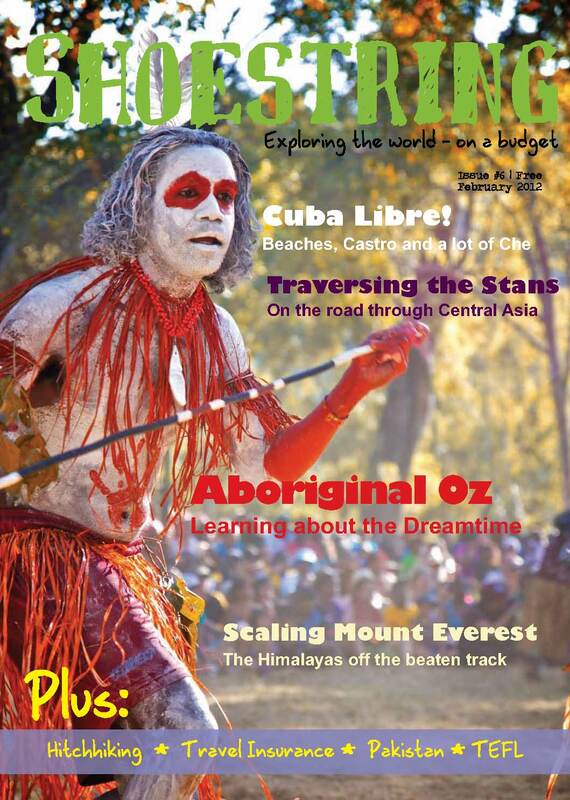 Shoestring issue # 6 out now! What do you have to do to get a job? Here's the thing: I graduated with a really good degree. Since 2004 I've been doing work experience as reporter and photographer worlwide. I speak 2 languages fluently, two more on a more basic level. I can write stories, take quality photographs, can do audio and video reports and have never misquoted anyone to my knowledge. My final grade in my degree was better than that of a few (working) journalists I know. Yet, I can't seem to find a media outlet willing to give me a go as either reporter or photographer. I'm beginning to think that this is a racial issue or gender discrimination. I know my qualifications and my previous experience are good enough, and I doubt I would have nearly as many problems in Germany as I am facing in the UK. No, I don't have any NCTJs. But I know many journalists, including editors, who don't have all of them either. Journalism has only in recent years become a profession you need a degree for. Whatever happened to talent and learning on the job? Besides, I have done media law but wasn't allowed to sit the exam. If you want to know why my degree wasn't NCTJ accredited, please take the issue up with the University of Cumbria. I still wait for an answer. Meanwhile I am being used by media outlets who never pay for all the work I give them but then don't hire me when I come to apply for an advertised job. I just wonder how much more I need to do to deserve a break?!? I heard a radio interview someone did who got one of the jobs I applied for... She kept interrupting her quite famous interviewee and it didn't sound professional at all... At least I know how to interview someone. I just got another rejection letter, for a job as press photographer that didn't even require previous press experience. My photo subjects include Barack Obama. How can that not be good enough?? I would like to know what else I need to do to get a chance to be a journalist! !